If the audience at the Imperial Theater on May 19 seems younger than usual, there’s good reason. It’s 10:30 in the morn and students from 13 lucky New York City schools and academies will each perform a number on the same stage where the original Les Misérables played and the current one does, too. To stress the importance of the occasion, Robert E. Wankel, president of The Shubert Organization, names other hits that have played this house: Pippin, Billy Elliot, The Most Happy Fella, et al. And now these kids will stand where Ethel Merman, Zero Mostel, Bernadette Peters and Hugh Jackman once stood. So while none of the students who sing “You Can Fly! You Can Fly! You Can Fly!” from Peter Pan. Jr. actually can, these kids from Collaborative Arts Middle School of Springfield Gardens are so excited to be on the Imperial stage that they’re almost walking (and singing and dancing) on air. Chancellor Carmen Fariña makes a good point when she says that “Children enjoy coming to school every day when they are involved in the arts.” Michael I. Sovern, another piece of the Shubert brass, says “We have a record 15 middle schools this year. Arts education is back!” The kids applaud that, but the sound is a whisper compared to the cheers Sovern gets when he announces that Darren Criss, better known to the kids as Blaine Anderson on 90 episodes of Glee, will be here. That is proved time and time again. For one thing, these kids make for an educated audience. Take when Brooklyn’s Spring Creek Middle School’s students position themselves next to each other in kickline formation; before they’ve even done a single kick, the audience applauds, for it knows what’s coming. It does the same when it sees that the troupe from Queens’ P.S. 23Q is starting its conga line during “Hola, Lola” from Dear Edwina. Jr. Although one girl steps forward and extends her arms out wide and then brings her hands together – the universal symbol for “Clap in unison with us” – she doesn’t have to. This young audience is already show-biz savvy and is applauding in time to the music. Musical theater doesn’t often get credit for vocabulary building, but as Brooklyn’s Gateway Intermediate School I.S. 364 does a fine “Belle” from Disney's Beauty and the Beast, Jr., I’m reminded of how many millions of children have learned the words “provincial” and “façade” from this excellent song. 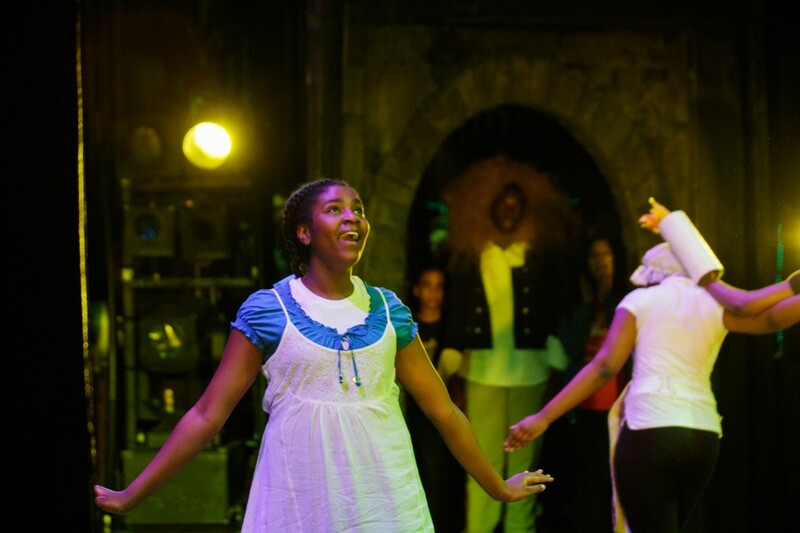 Students performing Beauty and the Beast, JR. at the Shubert / MTI Broadway Junior Finale 2015. Before the Bronx’s Jordan L. Mott Junior High School performs, the lad introducing it says he’ll be applying to LaGuardia High School of Music & Art and Performing Arts. A burst of applause says “Yes! Go for it! You can do it!” Moral of the story: encourage kids, and you’ll create kids who’ll encourage others. Mott does “One Jump Ahead” from Aladdin, Jr. – only a hop, skip and jump from where the pros are doing it at the New Amsterdam. Truth to tell, the number involves substantially more jumps than the title indicates. These kids’ll sleep well tonight. Aladdin, Jr. is also represented by Thurgood Marshall Academy for Learning and Social Change in Manhattan. “Friend Like Me” actually has its Genie do a bit of magic that gets an audience “Ooooh!” And speaking of magic, the students from Brooklyn’s Lyons Community School who sing from Fame, Jr. that “I want to make magic” have their hand gestures wonderfully coordinated. There are many talents at the Imperial today. Shubert / MTI Broadway Junior also keeps show music alive in this less-than-stellar-sales era of original cast albums. The moment that the students hear the first notes of “You Can’t Stop the Beat” from Hairspray, Jr., they’re cheering because they recognize it. However, they’ll soon be cheering much louder for the dynamic girl who plays Tracy in this Global Technology Preparatory Middle School production. Theater of course improves diction. The two girls from PEACE Academy in Brooklyn speak in perfect unison when introducing “3 Is a Magic Number” from Schoolhouse Rock, Jr. During the sharp presentation, the kids’ shy Do-I-really-belong-here? smiles turn into Yes-I-do grins. Brooklyn’s New Heights Middle School students, doing “It’s the Hard-Knock Life” from you-know-what-Jr., are all dressed in red T-shirts befitting the cover of the cast album. This includes the boys – yes, boys – and why not? There are boy orphans, too. Just ask Oliver Twist. As everyone sings “Santa Claus? What’s that? Who’s he?” I can provide an answer: Gerry Schoenfeld, Sharon Dunn, Freddie and Myrna Gershon, all of whom initiated this event; ArtsConnection, iTheatrics, Paul King and the Department of Education who have helped it grow. 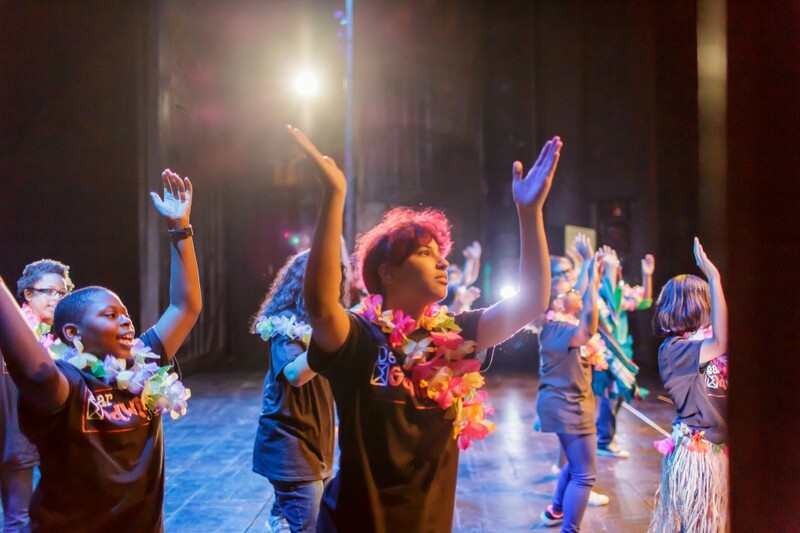 Students performing Dear Edwina, JR. at the Shubert / MTI Broadway Junior Finale 2015. The most potent speech of the day comes courtesy of Peter Avery, the Director of Theater for the New York City Department of Education. He points out that “Eighty percent of all new businesses will fail within the first five years. 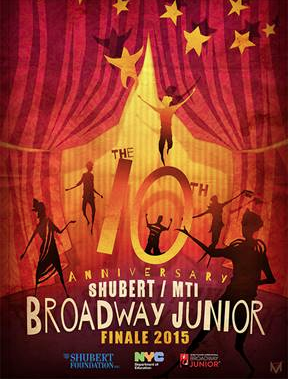 Only four in 100 will last ten years.” And yet, here’s Shubert / MTI Broadway Junior ready for Year 11. To put the depth of the program into perspective, Avery adds that “Most of our performers today were two to four years old when Shubert/MTI Broadway Jr. debuted 10 years ago.” He notes that many were probably all singing and dancing back then. “And you still are!” he beams. A semi-intermission allows a video to be shown. We hear from students (“Theater taught me how to get along with people much better” … “Participating in theater taught me how to communicate with teachers”), teachers (“Hard work beats talent, but talent doesn’t work hard” … “The arts breed perseverance”) and principals (“I love to watch parents see the most precious thing in their lives doing so well”). You bet! After that, Jean Nuzzi IS 109 in Queens does “The Teachers’ Argument” from Fame, Jr. The conflict has one teacher wanting her student, a potential choreographer, to be passed despite his poor academic record while the other teacher is adamantly against social promotion. It’s a fair fight that reminds the students that achievements both on and off the stage are equally important. At number’s end, both girls give out a whoosh of breath. Yes, arguing is hard work, isn’t it? Better to compromise early, don’t you think? One goal, of course, is to get as many kids on stage as possible. Thus four teachers from East New York Middle School of Excellence wisely decided not to have one girl sing “Tomorrow” from Annie, Jr. but to stage the reprise of the hit song so that FDR and his cabinet members could get involved too. When the first edition of my book Let’s Put on a Musical! was released, one critic pooh-poohed my including Into The Woods because, he reckoned, “kids can’t do Sondheim.” Wish he were here at the Imperial to see the three dozen kids expertly delivering much of the show’s Act One Finale. That expert would eat his words for an appetizer, his hat as an entrée, and crow for dessert. Kudos to the costume designer that didn’t dress everyone in the same shade of green. Aren’t there dozens of different greens in every forest? The final selection is “Why We Tell the Story” from Once On This Island, Jr. done by alumni of Shubert / MTI Broadway Junior. More than three dozen have returned to do the number, and they show how far they’ve come in a reasonably short time. Darren Criss returns and asks that the audience “Make a lot of noise for your teachers.” Even if Daffy Duck had asked the students to do it, they would have. Here, teachers are appreciated, even treasured. That doesn’t happen nearly enough. The arts let it happen. At the end, the large TV screens that state “Bravo!” No “Brava! ?” Well, we are in an era where many actresses prefer to be called actors, so perhaps that’s what the programmers had in mind. Performing is not all kids have learned about theater. The lass representing Spring Creek Middle School in Brooklyn wasn’t above announcing that “You are all invited to see our production in June.” Yeah, even on this level, kids know that the word “business” is an important part of show business. You may e-mail Peter at pfilichia@aol.com. Check out his weekly column each Monday at www.broadwayselect.com, Tuesday at www.masterworksbroadway.com and Friday at www.kritzerland.com. His book The Great Parade: Broadway’s Astonishing, Never-To-Be Forgotten 1963-1964 Season is now available at www.amazon.com.